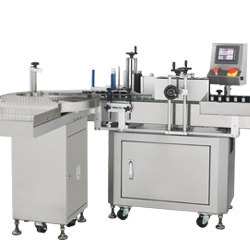 Manufacturer of a wide range of products which include automatic vertical ampoule sticker labeling machine, automatic slant ampoule sticker labeling machine, semi automatic sticker labeling machine, automatic ampoule sticker labeling machine, automatic horizontal ampoule and vial labeling machine and ampoule labeling machine. 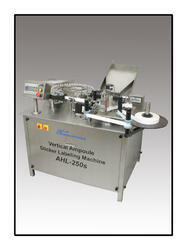 We offer the best quality of Automatic Vertical Ampoule Sticker Labeling Machine. 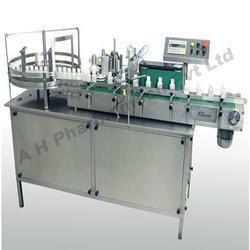 We are committed to providing the best quality Automatic Slant Ampoule Sticker Labeling Machine to our customers. 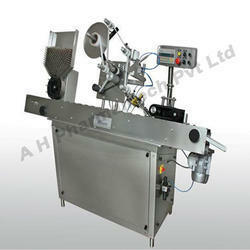 We offer a wide range of Semi Automatic Sticker Labeling Machine that is fabricated using high-quality components. 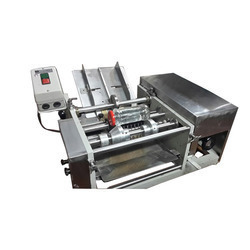 As an acclaimed enterprise of the industry, we are engaged in offering Automatic Ampoule Sticker Labeling Machine to our clients. We have marked a special niche in the global market by offering superior quality Automatic Horizontal Ampoule and Vial Labeling Machine. 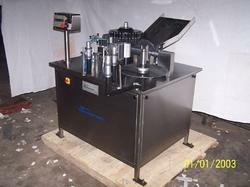 • The machine labels Ampoules and other cylindrical containers with diameter from 10mm minimum to 16mm maximum.• The labeling machine is used to label the ampoules. The product sensor senses the ampoule and gives command to labeling head to release the label which applies on the ampoule. 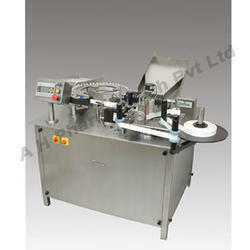 Wrapping belt wraps the label around the ampoule for wrinkle free labeling. Printing is done online. The printing and barcode/pharmacode is checked by the scanner. The system will automatically reject the ampoule which contains wrong or missing printing/barcode/pharmacode on label. The system will also reject the ampoules without labels.• It uses sticker labels having width of 18mm minimum and a length of 25mm minimum to a width of 50mm maximum and length of 50mm maximum from the sticker roll.• The rated output is 500 containers per minute maximum. It is recommended to use labels of 52 to 65 gems to achieve rated output. The mechanical machine speed is variable unto this rated output.• The Loading Screw releases containers into a Transfer Wheel in which containers each held between a pair of rollers and back up guide are passed to the labeling station in an upright position.• When the ampoule reaches to the labeling station, the sensor operates the servo motor. At this point of time, the sticker touches the ampoules and wrapped over the ampoule by the driven belt on roller.• Then Rubber belts press the Labels on Ampoules during passing through Rubber belt.• The labeled Ampoules passes through transfer wheel to chute and then onwards to then pushed to unloading tray. 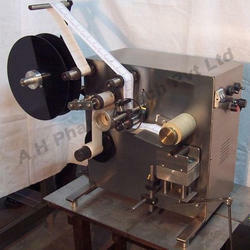 We offer a wide range of Automatic Slant Ampoule/Vial Sticker Labeling Machines that are fabricated using high quality components. 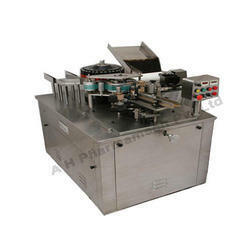 These cater to the needs of various industries and are offered at industry prices. Further, these are available with optional accessories like printing devices. 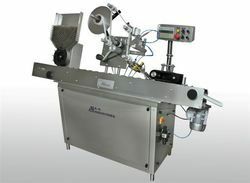 In addition, these are offered with the A.C. Drives for speed controls and no objects no label systems objects sensors and label sensors.Mode Of Operation & Description:• The machine apply labels ampoules, vials and other cylindrical containers with diameter from 10mm minimum to 45mm maximum.• It uses sticker labels having width of 20mm minimum and a length of 40mm minimum to a width of 50mm maximum and length of 100mm maximum from the sticker roll.• The rated output is 150 containers per minute maximum. It is recommended to use labels of 60 to 65 gsm to achieve rated output. 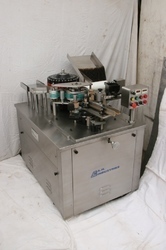 The mechanical machine speed is variable unto this rated output.• The Loading hopper releases containers into a roller conveyor in which each containers each held some distance by separators rollers and back up guide are passed to the labeling station in an upright position.• When the ampoules/vials reaches to the labeling station, the sensor operates the servo motor. At this point of time, the sticker touches the ampoules/vials and wrapped over the ampoules/vials by the driven belt on roller.• Then Rubber belts press the Labels on ampoules/vials during passing through Rubber belt.• The labeled ampoules/vials pushed to unloading tray.